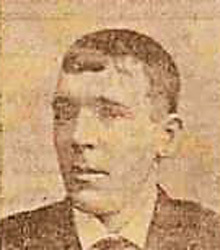 Willie Mercer (Outside Left, 1894-1909) – Local boy Willie Mercer joined Cowdenbeath in 1894. He was to prove one of Cowden's best ever investments and gave the club almost 15 years of faithful service. Willie was a skillful but hardy and powerful left-winger. He packed a tremendous shot in either foot and in most of his seasons at North End Park ended up as top scorer. In 1898, he had brief spells with Hibs and the English League club Glossop North End before returning to ‘the Miners’. In 1905, Willie had the honour of scoring Cowdenbeath's first ever goal in the Scottish League. Willie was secretary of the Cowdenbeath junior club, Vulcan Rovers, and a leading light of Cowdenbeath Cricket Club. He later spent 3 years as trainer of Cowdenbeath FC and was a referee. Mercer was also a founder member and official of Lumphinnans Bowling Club. He was a miner and died in 1932 aged 57 just after coming offshift at the James Pit at Donibristle Colliery.